April is a special month, marked by the most prized gem of all: the diamond. This Underwood’s custom necklace is made in 14k white gold and 18k yellow gold. 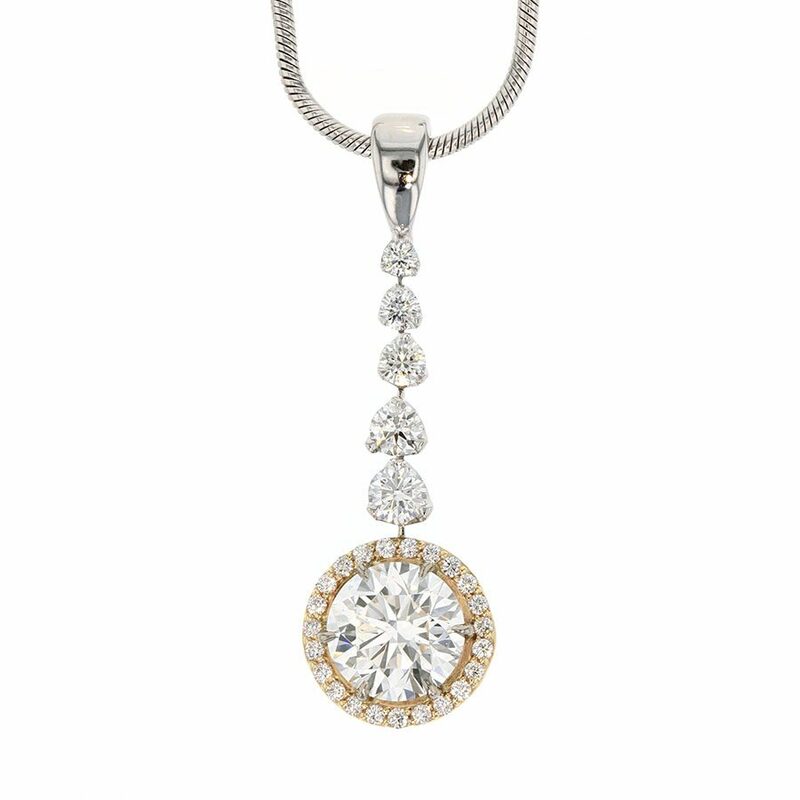 It features a 1.42 carat round ideally cut diamond plus .39 carats total weight of ideally cut accent diamonds. 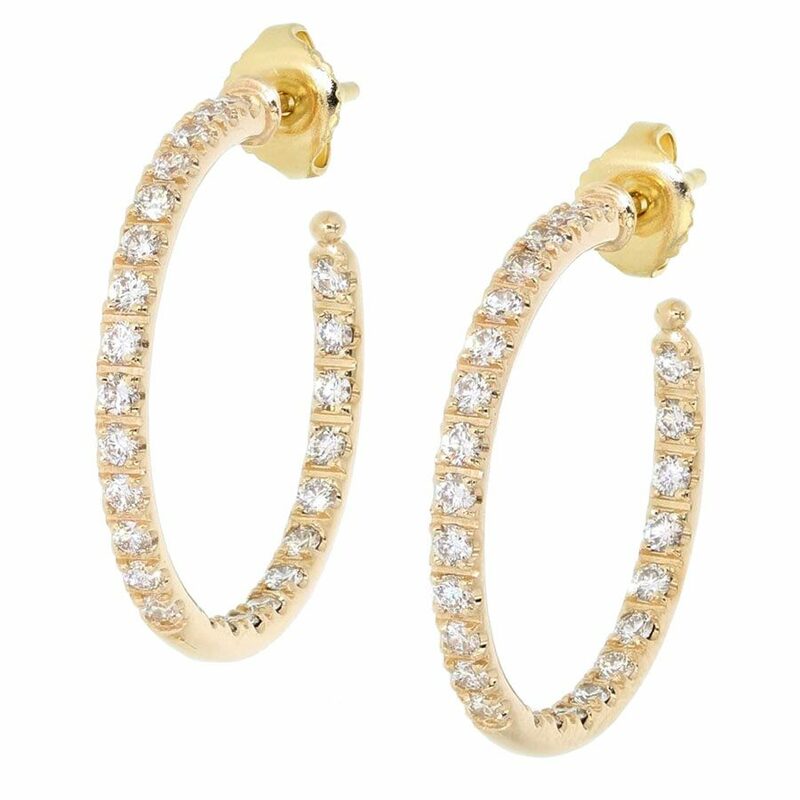 These hoop earrings are made in 14k yellow gold and feature 1.30 carats total weight of fully cut diamonds.of 1.80 carats. They are surrounded by fully cut round halo diamonds with a total weight of .46 carats. This spectacular Underwood’s custom designed ring is made in platinum and 18k rose gold. It features a rectangular radiant shaped diamond that weighs 2.62 carats. 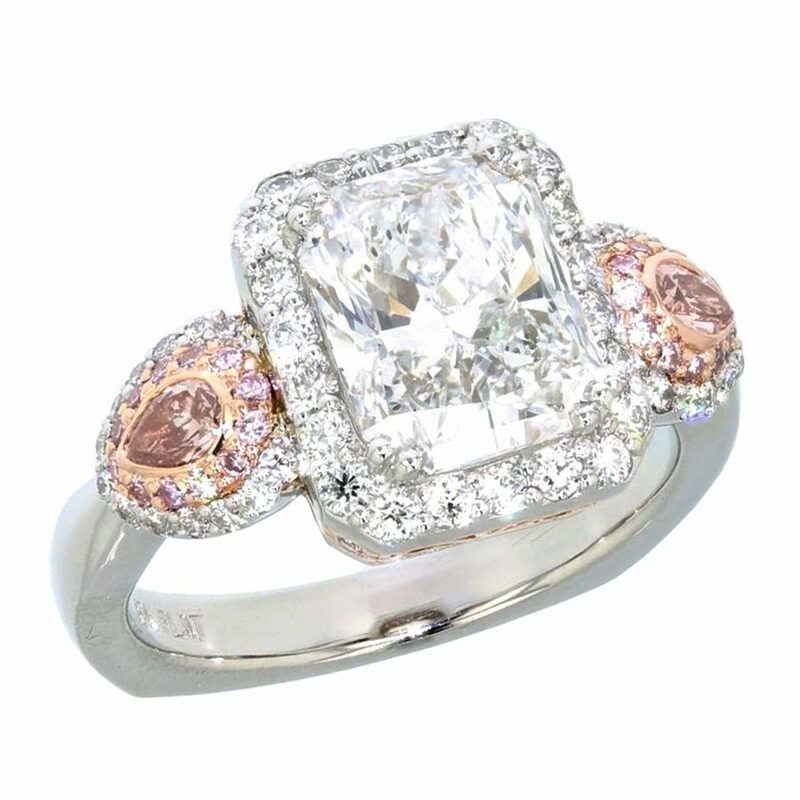 This is accented by two pear shaped natural fancy pink diamonds surrounded by halos of pink and white diamonds. Diamonds have an amazing ability to shine. The reflection and refraction of light within each faceted diamond creates the sparkle and brilliance you can see from across a room. The diamond is legendary for its hardness, it is 58 times harder than anything else found in nature! This is why it can only be cut with another diamond. If cut and polished with skill, diamonds have the ability to shine very brightly with fire and brilliance. Diamonds can come in a variety of colors, from yellow, pink, and red to blue and green, and generally those with the richest color are highest in value. Some historians estimate that diamonds began to be traded as early as 4 BC. Diamonds first became popular in India, when the Moghuls and Imperial Colony were able to mine them easily from deposits along major rivers. Some ancient cultures believed diamonds were the physical incarnation of lightning, and this association may be the root of the belief in the healing powers of the gemstone. Diamonds were thought to cure brain disease and draw toxins out of the blood. In many cultures the gem has been a symbol for eternal love, leading to its use in engagement rings. One of the most famous diamonds is the 140.50 Carat Regent, said to be the most beautiful diamond in the world for its exceptional cut and shine. Thomas Pitt, the Governor of Madras, acquired the uncut gem in India in 1698 and sent it to England to be cut. The Regent purchased the diamond from Pitt for the French Crown, and it was first set in the band of Louis XV’s silver gilt crown at his coronation in 1722. It was then worn on Louis XVI’s crown in 1775; set in the hilt of the First Consul’s sword in 1801; set on the Emperor’s sword in 1812; set in the crown for the coronation of Charles X in 1825; then was used to ornament the diadem of Empress Eugenie. It is now on display at the Louvre in Paris. The largest cut diamond in the world is the Great Star of Africa at 530.20 Carats. It was cut from the largest diamond crystal ever found, the 3,106-carat Cullian discovered in Transvaal, South Africa, in 1095. Joseph Asscher and Company of Amsterdam examined the crystal for six months before deciding how to cut it, and ultimately divided the crystal into nine major and 96 smaller stones. Legend suggests that the Cullian was part of a larger crystal, but the “missing half” has never been found. The Great Star of Africa is set in the Royal Scepter, which is kept with the other Crown Jewels in the Tower of London. With its prominent history and beauty that speaks for itself, the diamond is a truly special birthstone. To explore our diamond selection and find a setting perfect for that special someone born in April, visit our shop on Dickson Street in Fayetteville or call 479-521-2000 to set up a consultation for a custom design today.